In the past 6 years, Ben Byruhanga's life has changed completely. Born and raised in a time of chaos in Uganda, Ben worked for his uncle in a small car repair shop. There he met his wife, a Peace Corp volunteer from Minnesota. They married, and Ben moved home to Minneapolis with her ("She didn't tell me about the cold!"). They lived in UM's SE married student housing across the street from Newgate while his wife pursued her Masters in English, and Ben enrolled here. "Uganda is years behind in auto technology. I didn't have the skills to get a job in America," Ben explains. 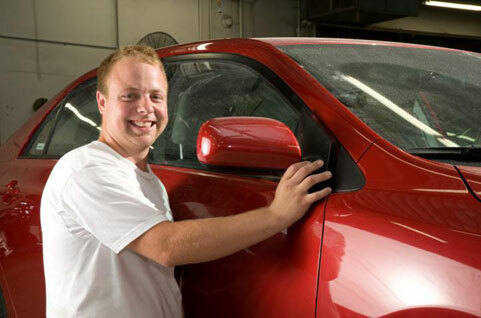 Now, Ben works for Seth Johnson at Midas Roseville, which Seth has developed into one of the top 5 Midas repair shops in the state. 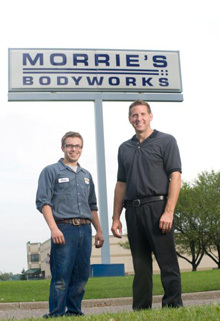 "Ben came in here with the highest work ethic, and excellent skills right out of the box. There isn't anything he's afraid to tackle," Seths says. "I've been selected to make automotive industry videos, and I know how effective good instruction can be. Mike and Mark at Newgate do a great job of teaching both sides of working: skills and how to work. And Ben took it all to heart " This job has made it possible for Ben to be living his dream here. He and his wife have 2 little sons and they just purchased their own home. "I am a man who can provide for my family. I have a job where I can earn good money. I learn every day and get better, and Seth encourages me. I am a proud and happy man." At the end of our interview, Ben throws up his hands and says, "I love America, I love Minnesota and I thank God for Newgate School! I have a new life!" "This is a great place for me, " Darius says. "Fridley Auto Body is small, friendly and the customers keep coming back. Yolanda and Jill have a whole lot more experience than I have, and I'm learning a lot." Darius has been a support team member in this body shop for a short time, but he is already stepping up. His biggest challenge has been to pick up his pace to meet the demands of a profit-making shop. Time is money, and costs need to stay within bounds. "It's a fun challenge, and I'm excited about how much more confident I'm becoming." FAB owner, Yolanda Newman, says, "This kid is driven. He is naturally friendly with customers, and he listens to what they say. He's been trained well at Newgate on bonding and prep techniques. And he's quick to spot ways to solve problems." Darius credits Gary Sworta for giving him lots of room to learn on his own, even make his own mistakes. "Then Gary would come back in to get me out of my messes. I could see how much better I got over time. Newgate's great that way." Jill Rizzo, GM, says, "For our shop, word of mouth is everything. And people are saying good things about Darius.And when our customers are happy, we are too!." Houa Xiong, whose family came from Laos, then Thailand, had already tried college and a medical assembly job before he came to Newgate School. Newgate promised hands-on training, and from the first day, Houa knew he could learn here. Instructor Gary Sworta trained him in metal skills: stretching, bending, core supports and basic frame work. And Don Smieja developed Houa's talent for details in body prep and painting.Teresa Buchta, General Manager of Abra Auto Body, Fridley, spotted his training and abilities right away. "Not a lot of young people are fluent in both auto body repair and painting techniques," she said. "Houa had great training at Newgate, and now is becoming very good at producing at a professional shop pace. We're lucky to have him." Sharka Pru emigrated here in 2007 from Thailand's refugee camp following Burma's civil war. With ESL help, he graduated from Fairview Alternative School, and entered Newgate because he was always captivated by cars. Newgate's hand-on auto body training worked well for his limited language skills, and he developed a confident, fluid movement to his auto painting style. Upon graduation, he had just the talent Jeff Wallgraff at Innovent was looking for. Jeff says, "Not only is he a good painter, Sharka has an upbeat personality and excellent work habits. I'd hire more Newgate grads in a minute." 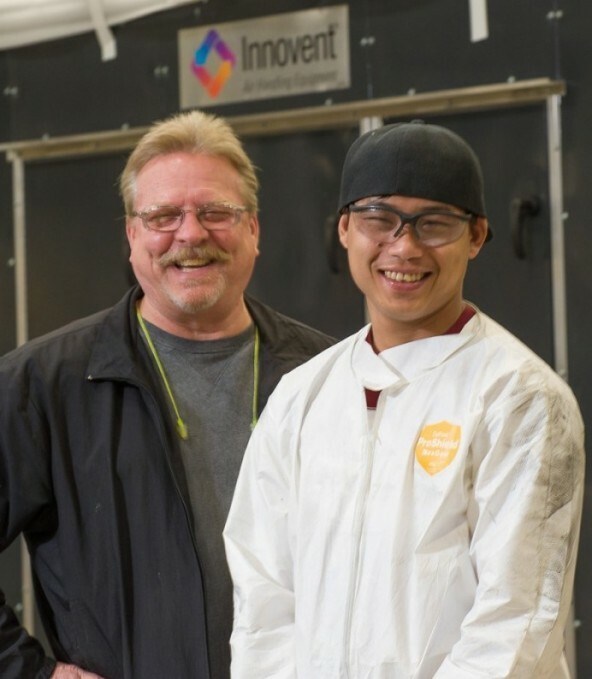 Innovent is a Minneapolis manufacturing company creating large scale heating and cooling equipment. 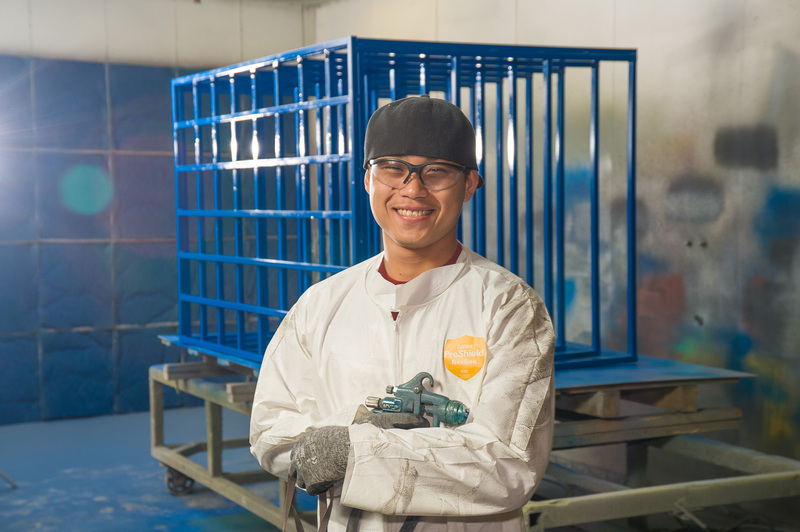 Sharka is now using the skills he honed at Newgate to paint huge furnace/air conditioning systems for shopping centers, sports stadiums, colleges, casinos and office buildings across the country. When he was a boy in Burma, Sharka says, "I never imagined I could live in America and work in a place like this. I'm pretty happy." Jim Fredette, Manorom Om's direct supervisor, says, "Right from the beginning, Manorom has been one of the most aggressive new hires we've made. There's no end to what he wants to learn." And it's a good fit for both Schwing America and Manorom, because Manorom is building Schwing's complex concrete pump engines. 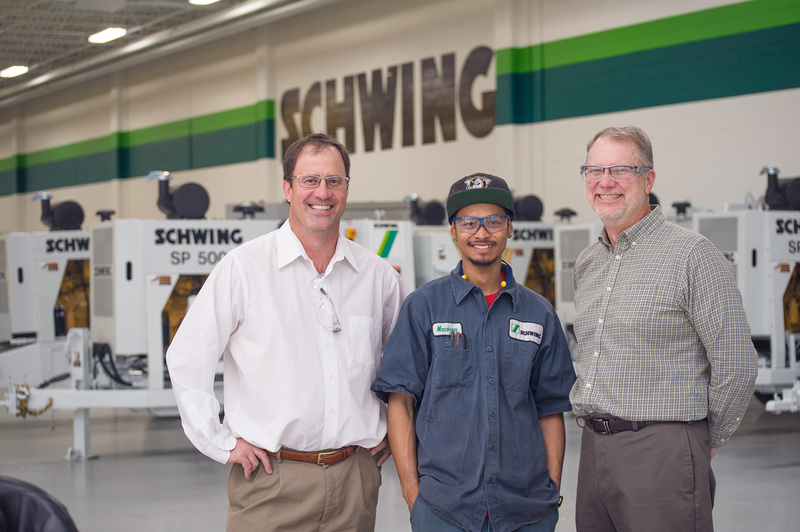 He works with a team of professionals who create these engines from detailed computerized plans, using parts that are designed by Schwing engineers and built exculsively for Schwing. What comes of all this attention to detail are powerful, well-made and long-lasting cement pumps used around the world. 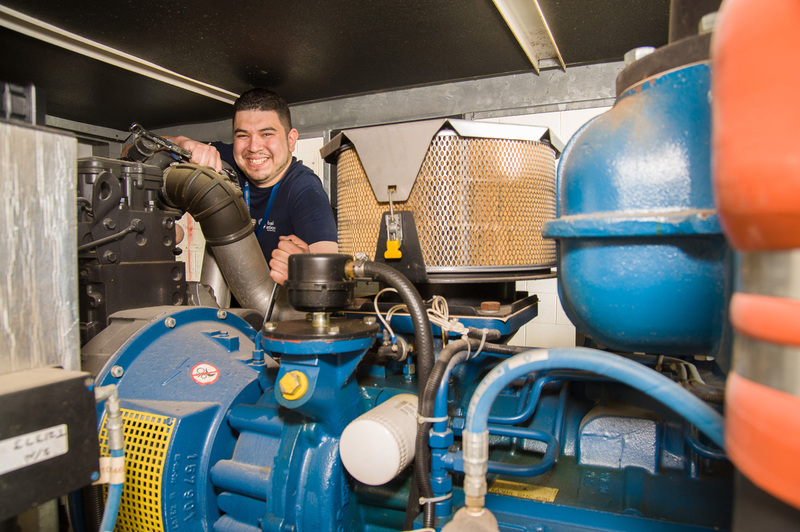 Manorom says, "Newgate taught me the fundementals of automobile engine mechanics. Now these guys are teaching me how to apply the basics to these complicated pump engines. It's great!" Fredette concludes, "Manorom is the future of Schwing. We need folks with sharp, flexible minds and good skills. Newgate, send us more Manoroms!" Have you ever wondered how MSP keeps all its support vehicles in good repair? How its baggage tugs, de-icing trucks, belt loaders, aircraft pushbacks and Sky Chef carts keep moving 24 hours a day? Newgate School grad, Alan Ramirez, knows: he repairs them. He's a mechanic for Global Aviation Services, located on the edge of the Humphrey terminal. "I can't believe my good luck landing a job like this," Alan says. "It's exciting. Any delay in getting a plane off the ground can cost the airline $1000 a minute. So when there's a problem, the pressure is on. I'm a puzzle solver, and I like the challenges here." Tom Kor, Alan's supervisor, said, "I couldn't have found a more hardworking mechanic than Alan. His skills and work ethic from Newgate are great. He's got endless energy - even when the 3AM emergency hits!" 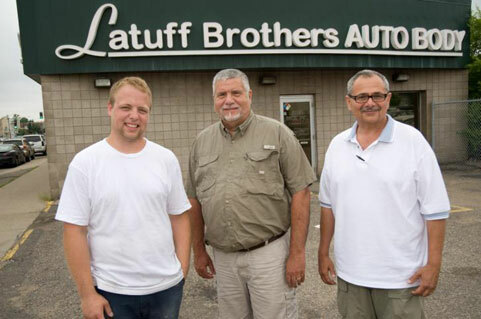 Now in his 8th year at Latuff Brothers Auto Body, Tim Haynes is making real money as a key member of their auto body team. Tim’s advice for success comes from Newgate instructors Gary Stwora and Don Smieja: “Those guys taught me this: choose a career you like; get yourself in the workday groove; stay focused; believe in yourself; support the company you work for.” He added, “Oh, and have some great hobbies for after work. I restore old speedboats from the 1950s-1970s, even the upholstery.” Peter and Mike Latuff, shown above, agree that Tim makes a real contribution to their award-winning shop (most recent: 2011 Integrity Award from the MN Better Business Bureau). 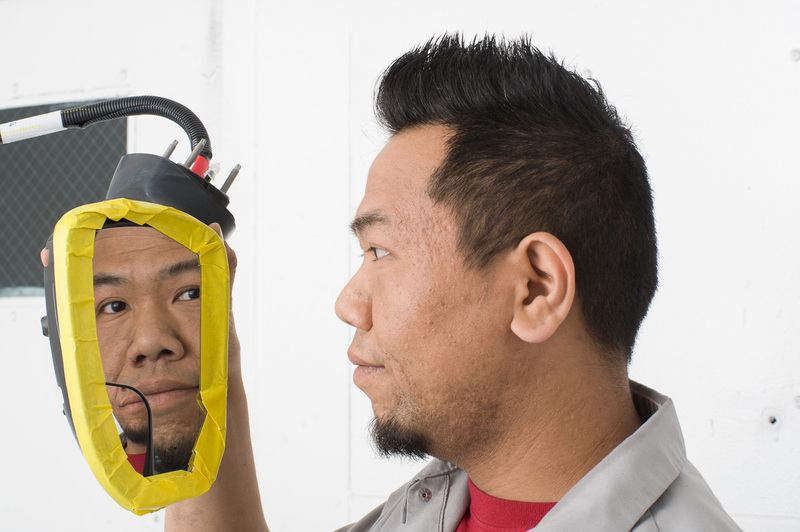 Kong Meng credits Newgate’s Lead Instructor in Auto Mechanics, Mike Scott, for kindling his interest in automotive computer and electrical systems. “Mike teaches systematically. Then he works at the details in different ways until you get it. He opened my mind to this specialty.” Kong is now repairing taxi radios, programming computers and wiring meters for Fleet Services which maintains 200-300 taxis for three leading Twin Cities cab companies. Patrick Moran, shop foreman, says, “Kong has a knack for this, for sure. He is team oriented even while he can work efficiently on his own. He has a great sense of humor, too.” On his time off, Kong loves music and is a popular youth leader for his church. Global Aviation Services corporate headquarters are located in Eagan, MN. With facilities located at MSP, JFK, LGA, DTT, BOS, CLT, LAS and many other airports, Global is a national leader in airport vehicle support services. Global is principally focused on maintenance in and around airports. Every day, 365 days each year, Global’s airport customers operate thousands of trucks and service equipment. Each piece of equipment must be in excellent condition to do its job quickly and safely, as lives and livelihoods of employees and passengers could be at risk. When folks say manufacturing has left the USA, they may not realize how alive and well it is in Minnesota. Schwing Manufacturing is a world leader in the manufacture of concrete pumping systems used in creating such icons as the new One World Trade Center, the Levi Stadium in Santa Clara, CA, the tunnel project in Niagara Falls, the expansion of the Panama Canal, and here at home, the Mall of America addition, the new St Croix River bridge, and the emerging US Bank Stadium for the MN Vikings. Tucked into Minneapolis’ north-side industrial corridor is Innovent Air Handling, a 35-year-old company manufacturing large scale heating and cooling systems. Their patented insulated furnaces and air conditioners keeps them at the front of the competition. Over the years, Innovent has evolved into a major air handling company doing business in all 50 states, throughout Canada, and in Mexico as well. Innovent supplies air systems to shopping malls, sports and entertainment facilities, schools, hospitals and universities, stadiums, office towers, hotels and industry. Innovent’s systems are built to withstand seismic activity and meet California’s codes. 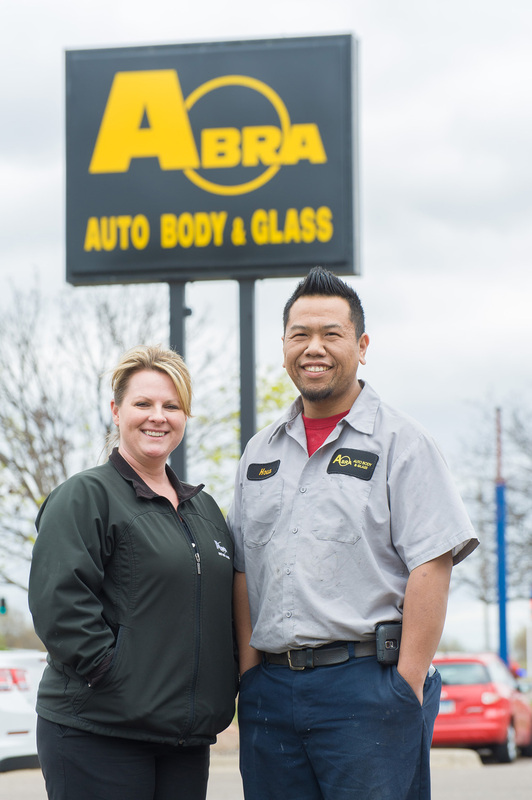 Abra Auto Body and Glass is the parent company of franchised auto repair service shops located throughout the country. This particular shop in Fridley is known for timely and excellent service and quality repair. Abra works with all insurance companies for repairs caused by accidents, weather and vandalism. Professional glass replacement/repair is provided here as well. Teresa Buchta, GM, comes from a family of car care professionals, and is locally known for her good customer care, and auto repair knowledge. She is one of only a handful of female auto shop general managers in the Twin Cities. 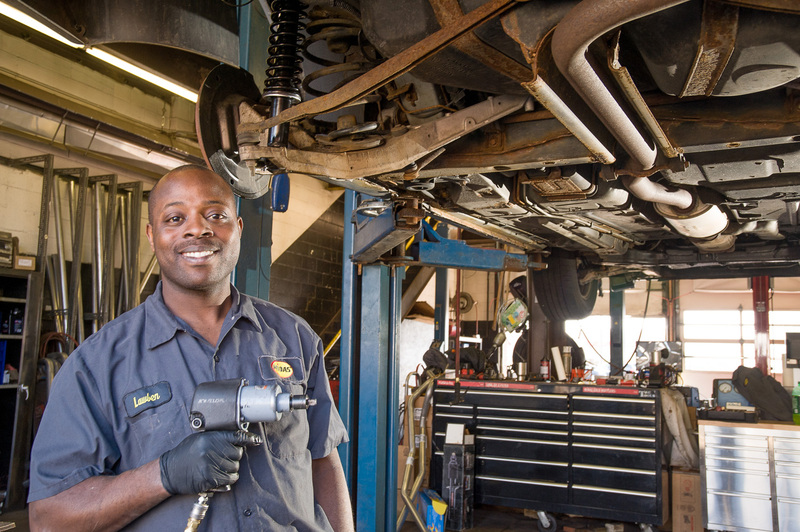 Fleet Services, Inc, 1907 Charles Ave, St Paul, 55104, performs routine maintenance as well as auto body and auto mechanical repairs for the 200-300 car fleet which comprises Green & White Taxi, Suburban Taxi, and Diamond Taxi.